As a full-time traveler, keeping my credit cards safe is a huge priority. Some of you might remember what just happened me with PayPal when they turned off my Debit Card when I was in the middle of nowhere. I did not have any backup credit cards with me. With the Wocket Wallet, I wouldn’t have to carry extra cards as all the information is stored safely and securely on the Wocket Card. I’m headed out of Alaska on a 3-month travel trip that has me going to 10 states and two countries. You can bet that I am worried about keeping my credit cards safe. Plus, I honestly am not a fan of carrying a bunch of credit, debit, or loyalty cards. I want to travel light and be smart about it to boot. What Happens if You Lose the Wocket? Make sure that the Wocket has your name engraved on it when you receive it. Remove the Wocket Card from the leather case and charge it with the enclosed charging cable. Swipe at least two credit or debit cards. Swipe or enter in your Loyalty cards for each store that you have. When ready to checkout, enter your PIN into the Wocket Wallet and select the payment method you want to use for this single transaction. By doing this, the Wocket Wallet programs the Wocket Card and readies it for use. Swipe the Wocket Card the same way you normally would at the credit card machine or show it to the cashier. Return it back to the safety of the Wocket Wallet. When you need to use a Loyalty card, select it on the Wocket screen and show it to the cashier so they can scan the UPC code from the screen. Not to worry, you might think now someone has all of your credit card information. Unless they can guess your PIN, they wont be able to access it. If you lose the Wocket Card with your name on it, just know that it only stores the specific credit card info that you put on it for the last transaction and it only is valid for a single use before being deactivated. Every time the Wocket Card is swiped it has to be reactivated with the Wocket Wallet. If you lose one or the other, they won’t work. They only work together with your PIN. To purchase the Wocket Wallet for yourself, buy it directly from their website WocketWallet.com for $179. Make sure to use this $30 off coupon: 30OFF-7ca3t5bf. But wait, there’s more. You didn’t think I would leave you hanging on wanting one of your very own now did you? Sign up for the giveaway and the winner will be selected on 10/29/15. Allow three weeks for delivery on your Wocket! Easy Peasy! Disclaimer: I was sent a Wocket Smart Wallet to review and give an unbiased review. I’m taking the Wocket with me on my next 3-month travel trip to really put it to the test around the US and internationally. Stay tuned to see how it does! My worst travel story would be losing money while traveling in a bus. People tend to get in your luggage when it’s been transported to another bus or location. It was really bad for me when I lost a credit card that I had to call and cancel immediately to replace it. I was carrying soooo much cash and coins that my bills and coins kept falling out of my wallet. I really need a Wocket Wallet. Carrying too many credit cards can take a toll, especially if you have them in your wallet. If you lose your wallet, you have to cancel all of them and replace them. I had to replace my Target card because of the credit card breach last year and it’s not a good thing! This wallet is awesome and what a great concept. It will be very useful for many of us that travel a lot! Have a safe/ wonderful trip!! I am absolutely in love with everything about this wallet. I love the idea of not having to carry as much around. The idea of advanced technology that works to keep us and our identity safer. Your name it and the wallet offers it. Talk about the perfect Christmas gift! Give yourself time to setup everything. Easy but takes time. Definitely a must have for travelers, really keeps your information safeguarded. Losing a credit card can be devastating since you have to cancel it and request a new one with new numbers to use. It can also affect your credit score. Having too many credit cards can be a problem because you have to keep track of what you have and also keep track of balances online. I carry alot of coins and cash in my purse and I hate it when my money gets lose. Sometimes, the coins are too have that I have to take them out when I get home from work. Lost my wallet at the club and had to call the 3 credit bureaus to report it to my credit report. I’ve tried Stratos but it’s difficult for me because you have to memorize what option to pick on your credit card and what lights to turn on. I think if everyone takes this, then this would be the ideal travel companion. This is a wonderful product. I have been using it, and love it. 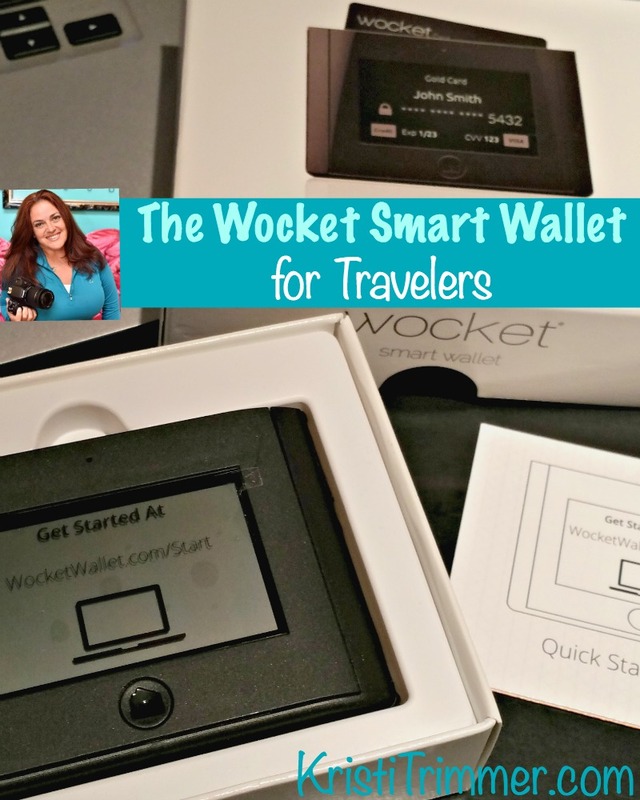 Wocket makes me feel safe taking my credit cards around the world.